Confession: I don't really own any fall/Halloween/Thanksgiving decorations. Living here in southern Arizona, we sort-of skip over the fall season. Instead of the start of sweater weather and hot cocoa, we are barely getting out of the triple- digit heat and are still sporting shorts. I decided our house should, at least, reflect this supposed fall we're in; so, I spruced it up a bit and decided to share some easy ways everyone can decorate. 1. Pom-pom garland: I bought different colored pom-poms from Hobby Lobby for a dollar per packet. Then, I took a needle to thread them together, to make this easy, but festive, garland. I love the color it adds to my chalkboard. I'll definitely be making a green and red one once Christmas comes along. 2. 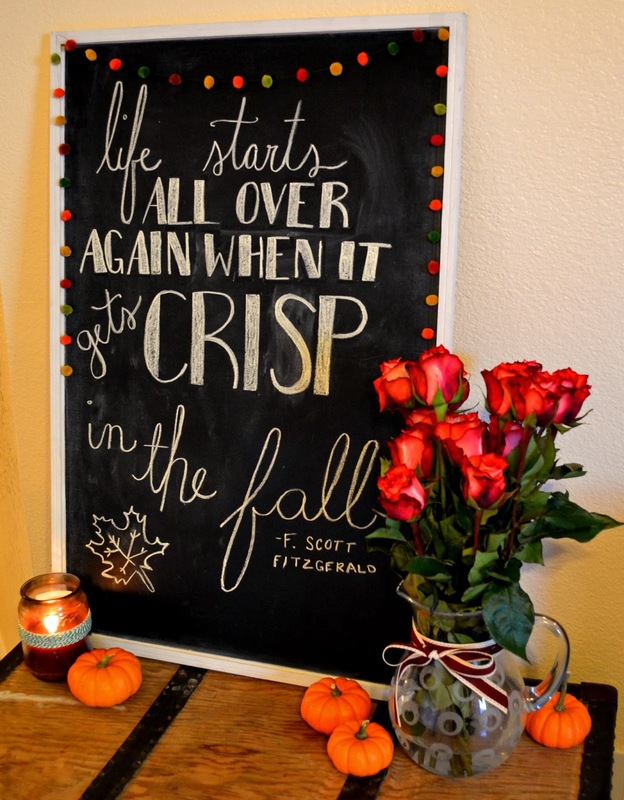 Chalkboard quote: After stumbling upon this quote on Pinterest, I decided to make my chalkboard match the season. Every time I see it, it makes me happy. 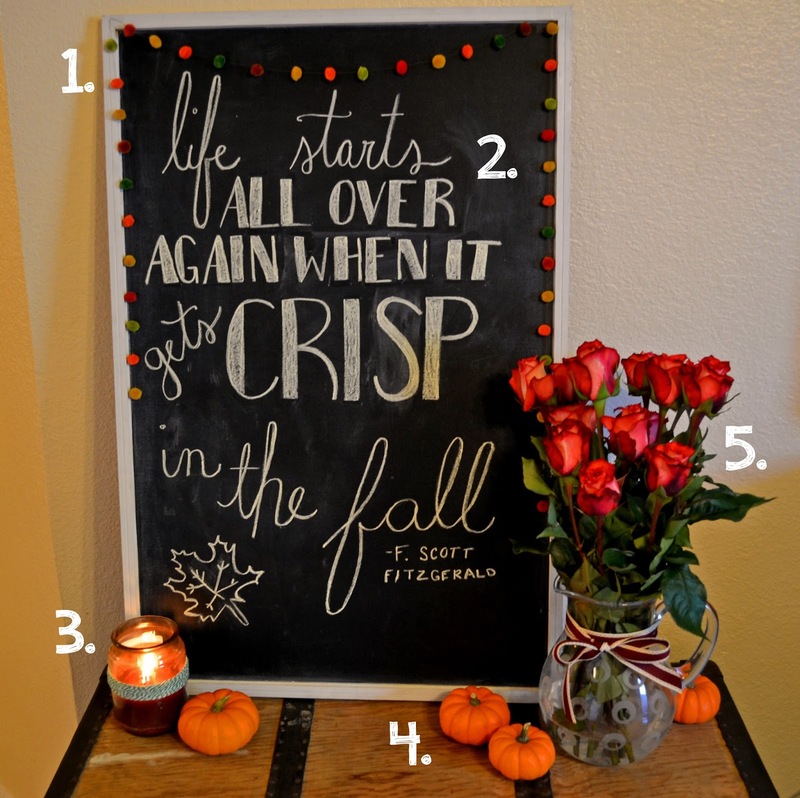 Chalkboards are great way to add seasonal quotes and change a room. 3. Fall-scented candle: Scented candles are a sure way to make your house feel more like fall. I took some twine, found in the Target dollar bins, and wrapped it around the candle a few times to make the glass jar feel more homey. 4. Mini-pumpkins: I found a bag of five mini-pumpkins at Walmart for $2.88. It was sort of an impulse buy, but I'm so glad I bought them. I love all the little pumpkins hiding around my house. 5. A festive bouquet: Flowers are a great way to add some fall color to a home. I recently found the coolest company called The Bouqs, who have been featured on Forbes, E!, The Today Show, Shark Tank, O! Oprah Magazine, and Popsugar. Why are they so cool, you ask? All their flowers come directly from South America, picked to order straight off the side of an active volcano!! Seriously, how awesome is that?! I picked an orangy-red rose bouquet and it has definitely brightened up our house. The pricing is great too- just a flat rate of $40 for all regular size bouquets with free shipping!! If you order flowers from The Bouqs send me a picture so I can see how awesome the rest of the arrangements are! And let me know how you're making your home feel more like fall in the comments below!